Standing on the cliffs looking down onto the exposed beaches of Orkney, the large boulders begin to move. Female seals and their pups are littered along the coast, a maternity ward on the cold Atlantic coastline. The seal pups are born in November and December in Orkney, later than in the south of England. The females haul themselves out onto the pebble beaches and remain with their pups for three to four weeks. Late autumn is the perfect time to deliver a pup. The weather may be cold and the nights long, but the mothers are in peak condition after a summer of fishing and warm weather. The pups are demanding and will increase by about 30kg in weight in their first two weeks. This results in weight loss for the mothers who give all they have to their pups. 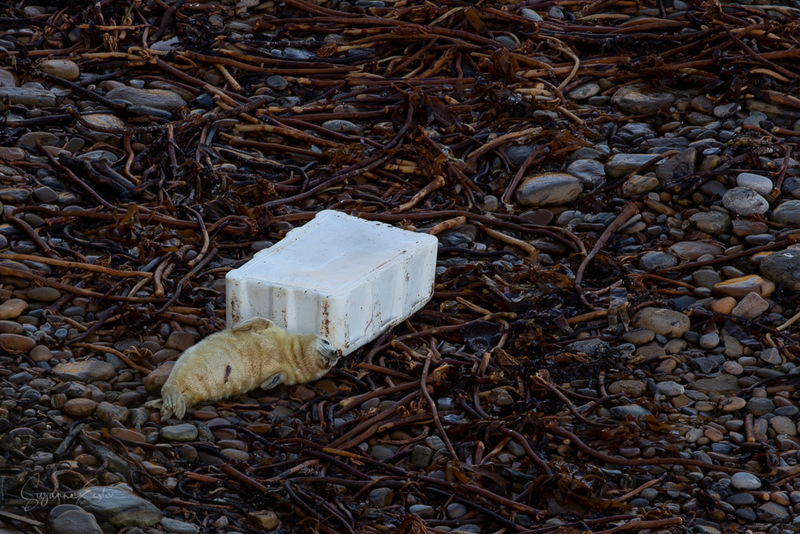 Whilst Orkney may be the perfect location to rear a young seal pup, the coastline is showing the effects of ocean debris. Even within the first few days of life these young seals are experiencing the effects of man on their habitat. A very young seal pup, possibly only days old snuggling up to a plastic fishing crate as it would its mother. Another laid asleep in the sun on a pile of rope and plastic, a mother and pup snoozing with plastic water bottles amongst the pebbles of a beach far from man. All avoidable sights if we cared for what we have on this planet. As with my experiences on Shetland at the gannet colony and diving in Gozo, plastic is everywhere, stifling the wildlife and permeating the natural habitat. It is sad to think that our disregard for nature is effecting day old pups and their future lives.